Making Automata is hard. Making other sorts of three dimensional objects can also be hard, but the extra dimension of movement seems to add a disproportionate amount of difficulty. This book is published by Cabaret Mechanical Theatre, a museum which has delighted its visitors with witty examples of the automata makers art since 1979. 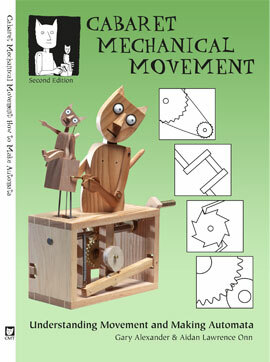 Title: Cabaret Mechanical Movement – Understanding Movement and Making Automata. Size: 119 A5 Pages with over 200 B&W Illustrations. Chapters: 1. Some Principles, 2. Levers, 3. Shafts, 4. Cranks 5. Cams, 6. Springs, 7. Linkages, 8. Ratchets, 9. Drives & Gearing, 10. Control, 11. The Checklist. 12. Bibliography. The link for making pin wheel templates is here.